You will need a standard LAMP stack to run ProcessWire. When creating your droplet, under Applications, choose LAMP on Ubuntu. A full list of requirements is available here. If you wish to have a contact form on your website, you will also need to ensure that sendmail is installed and configured so that you can use features that send email including password recovery and contact forms. The above link refers to the latest release at the time this article was written but you can see and choose from all available releases here. The above command downloaded the file 2.4.0.tar.gz. To extract these files and move them to your web root, use the following commands. Please note that the version number specified here may be different from the one you downloaded. Reload the page and that warning bar should go away. Click "Get Started." If you get some error messages, make sure that the site folder is writeable by the application. One way of doing this is with the following commands, which we will make secure after the installation. If everything is green, it's safe to continue. The next screen will ask you for your database credentials and the database you would like to use. You also have the option to set the file permissions if you would like to change the defaults—by default, directories are 755 and files are 644. 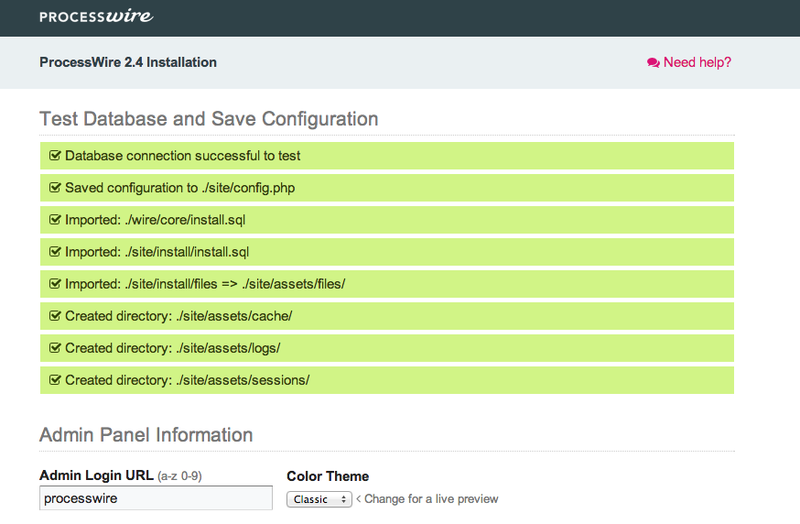 This can be changed later in the site/config.php file. You will need to create a user and a database in MySQL and give permissions to that user. Upon successful login, you should see mysql >. If your database was accessed successfully and the permissions applied to your files and directories, the following page should show all green. On this page you can also select which admin theme you would like to use and what you would like your login URL to be. The default is http://yourdomain.com/processwire. At this time, you also have the chance to create a username and password. The default username is admin but it is advised to use a username other than the default. Your password must be at least 6 characters long. 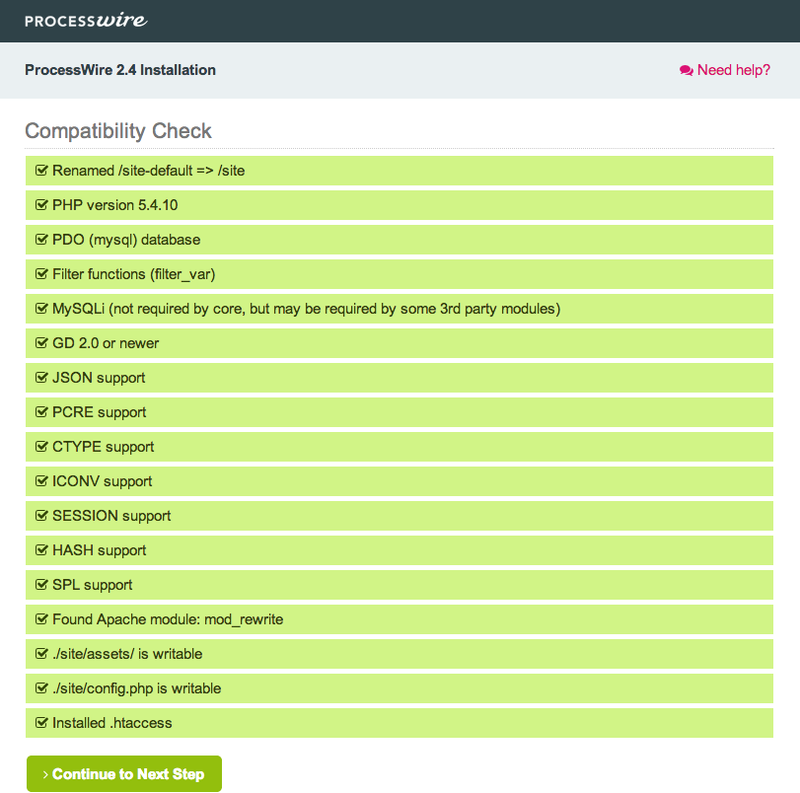 If everything has been done correctly, the next screen should give you some information about what ProcessWire did to secure your installation. 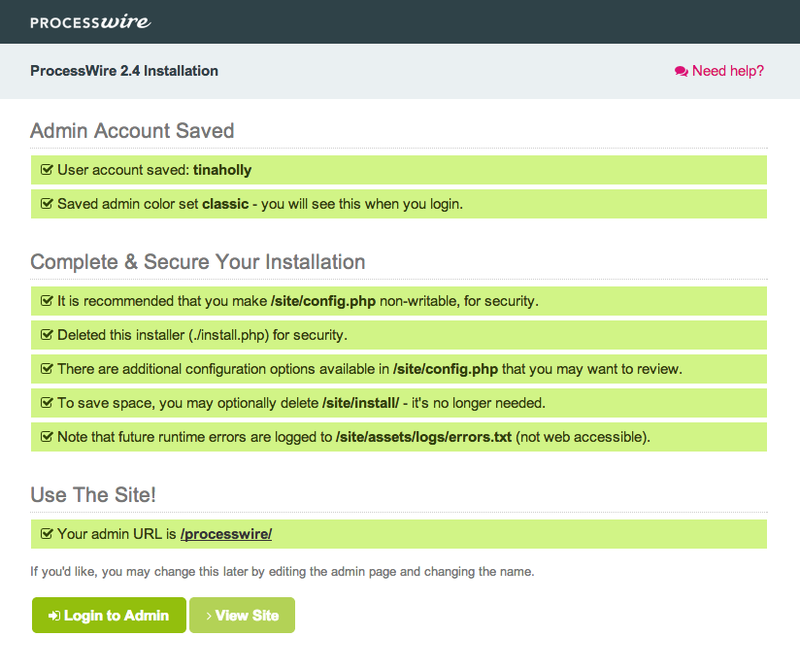 At this point, you can view your installation or login to your website! If you have any questions about ProcessWire, you can reach out to the friendly ProcessWire community in the forums.